When you get your peppermint from the kitchen market for daily use, ask your cook not to throw away the stems. You can plant them in a pot and place it on a spot where you get the most sunlight and water it scantily but on a regular basis. Soon the leaves will begin to sprout and in no time you'll have your own fresh peppermint supply. Why you'll go through this trouble, well because peppermint has an antispasmodic and soothing effect. It provides relief in digestion, nausea and intestinal gas. Peppermint tea is recommended for headaches, as a mild sedative and to treat some upper respiratory conditions, and if you can add a spoon of honey to it instead of the sugar, it instantly re-energises you. Don't forget how it flavours your omelettes and lentil soup and fish curries. Another plant that you should keep handy is Aloe Vera. It can be found in any nursery. Just make the effort of visiting one and adding it to your own garden in the balcony or on the rooftop. 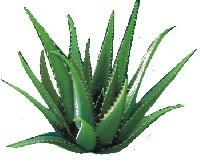 Aloe Vera can be used externally to restore skin tissue and aid in healing burns and wounds. Once in a while you can use the gel in your weekly home made hair packs of eggs, lemon juice or henna. It works wonders on stubborn dandruff that even the best shampoo fails to clean. Now, you cannot possibly plant cinnamon in a pot but ready stock of it should be always available at home. Cinnamon is a folk remedy for colds, flatulence and nausea. It settles an upset stomach and alleviates diarrhoea. Also stimulates appetite in anorexics. Also clove helps relive toothaches. Cumin or jeera has a cooling effect on digestive system and adds excellent flavour if you drop a few grain while your are boiling your rice or trying to fry rice the 'deshi' style. However it is possible to make moong sprouts at home. A handful of the pulses should be placed in a moist bowl in any humid corner of the kitchen and overnight you have your own sprouts. In this era of 'instant everything', get a pack from any superstore and refrigerate it among the weekly vegetables. Moong sprouts and other pulses are rich in protein, carbohydrates, the B-vitamins, fibre and low in fat which is mostly of the unsaturated kind. Fresh pulses and sprouts contain vitamin C. Soya bean sprouts contain are also good source of iron, calcium. It is said to very good dietary supplement for women in their pre or post menopause years. There are times when the world seems bleak, when you know that you have done something that is terribly wrong, but can’t turn back time to correct it. You go to bed wishing that morning would never come, and knowing that you will never be able to face the world in the same way again. Feelings like this crop up usually, and almost always, these are responsible for poor performances by you. Of course to improve performances, you would have to work on those feelings. What exactly is the root of all these feelings and negative emotions about oneself? Simple…it is nothing more than a serious case of low self-esteem. Improving self-esteem is not just necessary, but is extremely crucial. Ways to do this are simple. Try to look at the bright things in life. Ask yourself if you are happy, and if you get a negative answer, ask yourself why. Be more sociable. In your free time, interact with people you actually enjoy being with. Try to devote time to yourself; being organised will also help. If you think you are naturally messy, try observing or taking pointers from someone who is naturally organised. Being organised helps considerably by greatly reducing last minute aggravation, especially when you cant find 'that important file' and you have just two minutes left for 'that important meeting'. Instead of envying someone, try to pick their good points and learn them. Include more exercise in your life. Working out, particularly outdoors, is a great way to generate your body confident as well as energising you. It also helps in keeping fit, and enhancing your appearance. If you look good on the outside, it's much easier to feel confident inside as well. Keeping a diary often benefits. A diary isn't always a record of daily events and appointments, its only about feelings, dreams, aspirations…basically it's about you as a person. People often tend to view life either as an enjoyable or a miserable journey, which they have to endure, before reaching their destination. Never make life so complicated. Simply learnt to consider life as a challenge, and apply your best effort into it. Remember: there are times when attempts count more than results. Almost all of the bits and pieces mentioned above are long term. If you are just wishing for a quick boost to your self-esteem, there's only one other way that will help. Face the mirror and start talking to yourself. Address your reflection, and mention all the good qualities that you possess. Then take your time and list all your achievements (they don't have to be big, even small ones count). Recollect the times when you have done something and have been thanked profusely. Rest assured that when you finally walk away from that mirror, the boost in self-esteem will have you feeling like you are on the top of the world! I was staring at the ceiling. It had an unusual wallpaper with a flower motif. Each time that I was counting the bright yellow petals, my mind was drifting off to somewhere unknown. Somewhere dark. My limbs were aching. It was an excruciating pain. I knew the injection had done me no good but left me paralysed with pain. I could still feel the pricking of the needle on my flesh. Though the doctor had told me that could walk again, some where I felt that I cannot still walk like before. I needed some kind of support, some kind of shelter. A stick, a crutch or any kind of material that would help me stand up on my own feet. I turned my head and looked at the small window that opened up to the world outside. The world that was so beautiful. I am not much of a nature lover, but the sky looked amazingly stunning. It was grey and a cool breeze was blowing outside. There was also the occasional drizzle but what I was enjoying the most was the "breeze." For a moment , it seemed the wind had a magnificent healing power that was purifying my bruised soul. It was rejuvenating my body and replenishing my tired flesh with an unusual vigour. Suddenly , I was feeling strong again. The wind was wet and I could taste it even after having the bitter cough syrup that I deeply loathed. It tasted sweet and really soothed my taste buds. I lit up the small green lighter that was lying close to my hand. Here, I have to say that I wasn't a smoker. The small flame glowed brightly in the darkness. It made me wonder, that even the light of the little flame made so much difference in my small dark room. It illuminated the entire cell. Anyway, I threw down the lighter and looked up at the ceiling once again.